CSGO Hoodie Without Zip. Withe CS GO Logo Printed on the front of the hoodie.Slim fit. 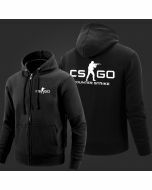 for gamers CS GO hoodies new autumn winter CS GO men sweatshirts warm fleece CSGO hoody men tracksuit hip hop streetwear.